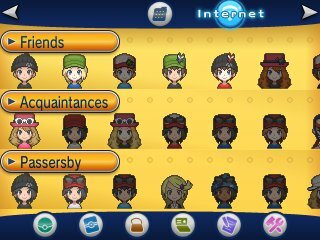 Using the PSS, you'll have full access to your entire friend list, being able to see who is online and what they are doing in real-time. If you tap their icon, you will be given a variety of options. First, you can send them a "Nice" for their activities. You can also select to battle or trade instantly from there. 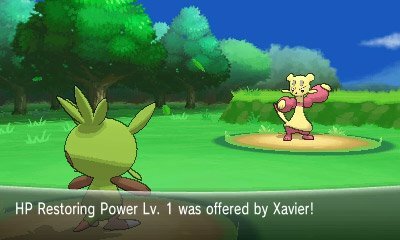 In addition to the standard battle & trade, you can send them O-Powers, ask to view their Trainer PR Video and finally to chat with them utilising the Nintendo 3DS's microphone. 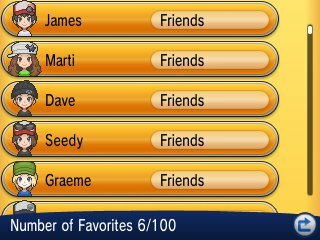 In addition to the Friend list, you can see a variety of Acquaintances and can utilise the same features with them. Acquaintances are people with whom you have interacted in systems such as Wonder Trade or Battle Spot. Finally, Passersby are all random people who are connected either locally or through the internet. Like Acquaintances, you can challenge them to battles and trades. 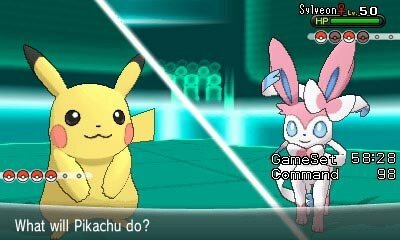 The first feature you'll find in the PSS allows for you to quite simply battle with someone locally or over the Internet without the need to go to the Pokémon Centres across Kalos. With the battles, you can select through various options to battle with Infrared, Wireless or over the Internet. First, you can select Single, Double, Triple, Rotation or Multi Battles. 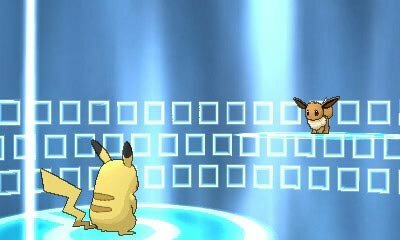 If you're selecting Multi Battles, you can invite other friends to it. You can then select rules. Normal Rules: These rules allow for anything with no restrictions, but set all Pokémon to Level 50. No Restrictions: This runs like Normal Rules, but it doesn't auto level the Pokémon. Before the battle begins, you have the ability to alter your Pokémon, by attaching various items from your bag onto them and you can select between using your party or the Pokémon in your Battle Box. Your Pokémon are healed for the battle, should they be injured. 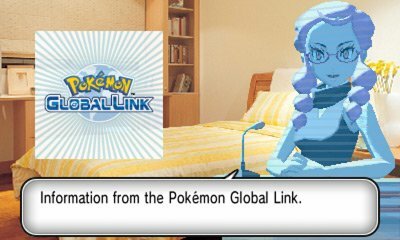 The second feature runs akin to the previous one, and allows for you to trade with someone locally or over the Internet, again without the need to go to the Pokémon Centres across Kalos. As usual, there are no restrictions, but it will prevent you from sending a Pokémon with a HM from your party. The Battle Spot works in a similar manner to the Random Matchup feature of Pokémon Black & White. 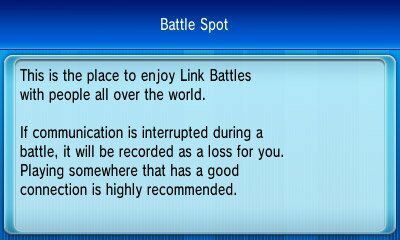 Here, you'll be able to battle with random people within two modes: Free Battles and Ranked Battles. Ranked Battles allow for you to accumulate a score that is then posted to your profile on the Pokémon Global Link. A new feature added to this, is the inclusion of penalties for disconnecting. If you disconnect now from battle, you will have a loss recorded to your record. 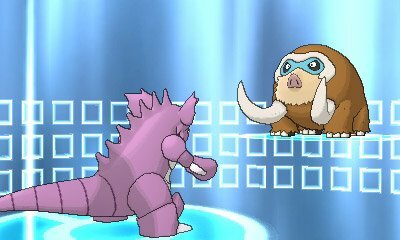 The Wonder Trade feature works similar to the Battle Spot in that you will be connected to a random trainer around the world. 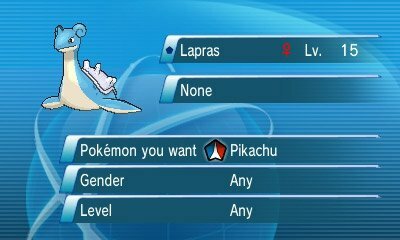 However, with this trade, while you can select whichever Pokémon you wish, you will not know what Pokémon you receive in the trade until the trade is in progress. The Shout Out feature allows for you to send messages out to everyone on your friend list, and who you're connected to locally. Unlike previous games, the messages you can send are entirely created by you, utilising the touchscreen as a keyboard. In addition to that, you can run updates for the software from the internet and search for special announcements locally or through the internet, to make sure you know that there is a distribution running. O-Powers are a new feature that work similarly to Pass Powers, but also have a more ranged effect. Several O-Powers will allow for you to increase stats within battle, while others will help you gain more experience or make your captures more likely. Like in Pokémon Black & White, you have the ability to share your O-Powers with your friends, but this can now be done over the internet. 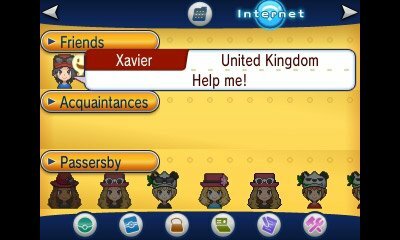 Within the PSS, you have the ability to view your friend's profiles within their screen. When you do so, you can mark them as Favourites. This allows you easy access to them when they're playing, placing them at the front of any on the friends list. Yiu can also select the Favourites icon on the PSS menu to gain easy access to your friend list. Within the PSS, you will have a profile. 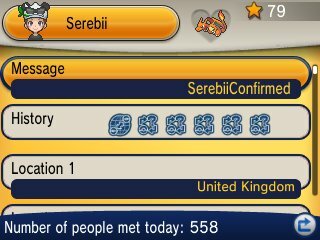 This profile will list various details about you, as well as give an image of your character as well as showcase the Pokémon you have in Pokémon Amie as well as your last six activities. In the profile, there are various quiz questions asking you what your favourite type is, or what you like most about Pokémon. This will then be shown on your profile to anyone who wishes to view it. Finally, you have the ability to change your public icon and your profile image. The public icon is default as your own character, complete with all customisations. However, if you do so wish, you can select the icon of many trainer classes such as Youngster, Karate Kid, Lass etc. In addition to that, as you progress through the story, you will unlock the icons for Professor Sycamore, your rivals, the Gym Leaders and the Elite Four. 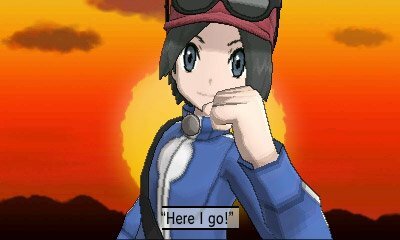 Finally, you can change your profile image to be any image that was captured on your 3DS, from a photo taken in-game, to one taken with the 3DS camera.